At this year’s retreat clergy gathered from throughout the large diocese, comprising 16 states. Fr Seraphim Chemodakov provided the keynote address of the retreat, which the gathered clergymen found quite valuable. The resolution of the retreat is found below, and provides a synopsis of the retreat activities and guidance to the faithful of the diocese. We the clergy of the Diocese of Chicago and Mid-America met at Holy Virgin Protection Cathedral from March 18-20 for our annual Great Lenten clergy retreat. The retreat began with Archbishop Peter leading the faithful in the celebration of the Mystery of Holy Unction, which is a poignant reminder of the spiritual healing we all require as we reflect on our passions and strive for repentance during this lenten season. Archbishop Peter reported on the general affairs of the diocese, including recent ordinations and new missions. He also reported that Archbishop Alypy had a recent stroke and has partially recovered. We ask for your continued prayers for Vladika Alypy. Archbishop Peter also gave us guidance and pastoral counsel on the church situation in Ukraine and how it affects us in the diocese. We as clergy lament the conflict in Ukraine. We express our sorrow over the resulting suspension of concelebration with the Church of Constantinople. At the same time, we fully support the decision of our hierarchs in this regard. We pray that our Lord Jesus Christ will grant peace and unity to His Church. We are confident that with the help of the Holy Spirit, our hierarchs will continue to guide the Church aright. 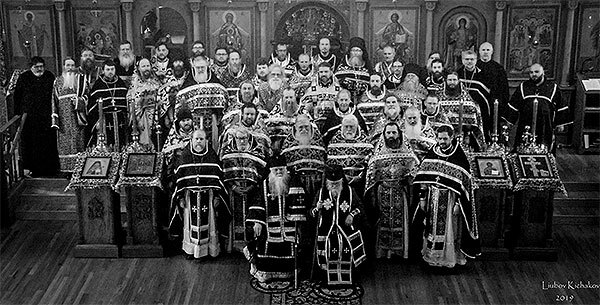 We condemn the persecution of the clergy and faithful of the canonical church in Ukraine and we continue to support and pray for Metropolitan Onuphry and his flock during this time of tribulation. We continue to value our fraternal relations with all Orthodox Christians and we look forward to the restoration of normal ecclesiastical relations. The focal point of the retreat was a presentation and discussion of mental health issues and the pastoral challenges associated with ministering to those affected. We thank Fr Seraphim Chemodakov and Fr John Michet, both licensed psychotherapists and counselors, for their presentations on mental health. We have reviewed and approved new diocesan guidelines on how to minister to those experiencing mental health crises and how to seek professional assistance when needed. It was pointed out that clergy are often the first contact for such issues, and it was recommended that we become familiar with professional resources in our areas. We urge anyone suffering from mental health issues and afflictions to seek guidance and healing from their spiritual father and clinical professionals as recommended. The retreat culminated with the celebration of the Presanctified Liturgy on Wednesday, presided over by Archbishop Peter and concelebrated by priests and deacons from around the diocese. We ask for the faithful to continue their prayers for the stability and well-being of the Church and to support the important ministries of our diocese.